Until September 15, 2012, the Eaton Hotel is offering free tours of Hong Kong. Simply book a room at their best available rate, and enjoy a complimentary harbor cruise, tour of Temple Street / Jade Market, and a tai chi class. Nightly rates start from HKD1,000 (USD128) for a Superior Room or HKD1,100 (USD140) for a Deluxe Room. All rates are subject to a 10% service charge. 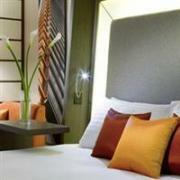 Pay for 2 consecutive nights at the Sheraton Hotel & Towers Hong Kong and receive the 3rd night free. Rates for the payable nights start from HKD2,700 (USD345) for a Deluxe Harbour View Room with a 37” LCD TV, DVD player iPod dock, king or twin-sized beds, and a stunning view. A 10% service charge is additional. The “Free Nights Offer” is available until September 10, 2012. Book your stay at the South Pacific Hotel in Hong Kong to enjoy discounted room rates plus free internet access and shuttle service. Online rates start from HKD800 (USD102) for a Standard Room, HKD900 (USD115) for a Classic Standard Room, and HKD1,100 (USD125) for a Modern Standard Room. A 10% service charge is additional. This is an on-going promotion. Save up to 40% with the “City Breaks” promotion at the Novotel Hong Kong Nathan Road Kowloon. Discounted rates start from HKD1,138 (USD147) for a Superior Room inclusive of breakfast for two people and late check-out. A 10% service charge is additional. This promotion requires a minimum stay of two nights and is valid through December 31, 2012. 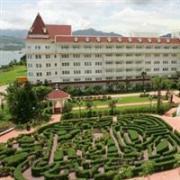 Experience the best of Hong Kong Disneyland with a 2-day ticket and a night at one of the on-site hotels. The package costs as little as HKD1,211 (USD155) per person at Disney’s Hollywood Hotel or HKD1,484 (USD190) at the Hong Kong Disneyland Hotel. Rates include 10% service charge. This promotion is available until December 12, 2012, for a minimum booking of two people. 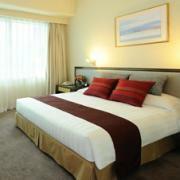 Book online to enjoy rates as low as HKD550 (USD70) at the Rambler Garden Hotel in Hong Kong. The quoted price is for a Superior Room based on single or double occupancy. Deluxe Rooms with free in-room WiFi start from HKD950 (USD121) per night. A 10% service charge is additional. These are best available rates available on select dates through December 31, 2012. From now through December 31, 2012, book a Superior Room at the Park Hotel Hong Kong and receive a free upgrade to a Deluxe Room. Nightly rates start from HKD1,300 (USD166) without breakfast or HKD1,400 (USD180) with breakfast. A service charge of 10% is additional. 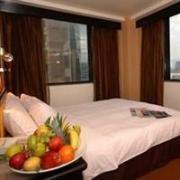 Deluxe Rooms are larger with an LCD TV, in-house movies, free internet access, mini-bar, and stunning city view. Superior Rooms at the Ramada Hotel Kowloon start from just HKD1,100 (USD140) per night during the “Special Accommodation Offer” sale. Deluxe Rooms are also available from HKD1,300 (USD166) and Executive Rooms from HKD1,600 (USD205). Buffet breakfast can be added for a special price of HKD90 (USD11) per person. Promotional rates vary by day and are available through May 31, 2012.